Seven species of bumblebee were observed in total, six are shown on PLATE 1. Bombus lucorum queens emerged first in late April, followed a few days later by B. terrestris, and then B. pratorum within a week. All three species were seen foraging on cultivated varieties of spring flowering heather. B. lapidarius, B. pascuorum and B. hortorum queens emerged during May and early June. 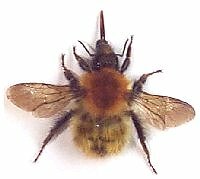 B. distinguendus was observed once on 24th and once on 26th of June, on both occasions it was a queen that was seen, after the 26th B. distinguendus was never seen again and has been excluded from the data analysis. In early August the first males were seen; new queens of B. lucorum were seen first on 15th August. The last bee, a B. lapidarius queen was seen foraging on the 4th of November. PLATE 1. Six species of Bombus seen during bee walk. 3.2 RE-SIGHTING OF MARKED BEES (TABLE 1) During June only about ten bees were marked each day, as the effect of the marking on the bees was not yet known. Many queens were still foraging in June, and a few in July, consequently many of the bees marked during June, and some during July were queens. In July there were few bees to be seen, only a very small percentage of the marked bees were re-sighted, and some of those that were foraging in the bee walk area were queens. During August the number of bees marked increased, as did the number re-sighted, some bees were re-sighted over twenty times. 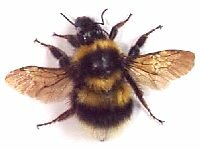 The bees marked in August were workers and males, although it is possible that newly emerged Bombus pratorum queens were marked, as there is little difference in size between them and larger workers of the same species. TABLE 1. The number of bees marked and released during the bee walk and pilot study, and the percentage of bees re-sighted at least once; includes re-sightings made on 15th August. *Many of the bees marked during this period were queens. **During the pilot study 14 queens were confined to artificial nest boxes in an effort to get them to start a captive colony, one Bombus lapidarius worker which refused to fly away was confined with a B. lapidarius queen. The total number of bees, both marked and unmarked, of each species recorded during the bee walk is shown in FIGURE 3. In June many queens were still foraging alongside some early workers. On the 24th no Bombus pascuorum were seen the entire day, whereas on the three previous days they had been foraging on Vicia sepium. In July there were still some queens foraging but very few bees were seen in the bee walk area; on the 5th only one Bombus lapidarius and one B. hortorum were seen during the entire day, however many bees were seen flying overhead, possibly to other nectar sources. The numbers foraging in the bee walk area rose considerably in August. B. lapidarius was the forager most commonly seen during June and August, but during July B. pascuorum was the most common bee. During August 78.8% of the bees recorded foraging during the bee walk were marked bees, many of the individual bees were recorded on more than one walk. When a marked bee was recorded twice during one bee walk, only the first sighting was used in data analysis. FIGURE 3. The number of each species of bumblebee seen during the bee walk in June, July and August 1995.  The Labiatae with their gullet-shaped flowers, requiring the bee to bend its tongue down to the nectary once it has entered the corolla. Digitalis purpurea is included in this group although it belongs to the Scrophulariaceae, it requires similar handling once the bee has entered the corolla.  The Leguminosae, all the flowers have a fairly similar morphology with a very small corolla opening, but once that has been entered it is a straight path to the nectar.  The Compositae which provide good landing platforms where the bee can probe many flowers before flying to the next head.  A miscellaneous group that have visible nectar and were open or had wide corolla flowers. TABLE 2. Flower data for species used by bumblebees in the bee walk in June, July and August 1995. Minimum distance to nectar is the distance from the corolla opening to the nearest nectar (for Digitalis purpurea it is the distance the bee has to stretch its tongue past the ovary to reach the nectar). Handling is the relative difference in handling difficulty of the species encountered in the bee walk. The handling difficulty in TABLE 2 was relative, as there were no truly difficult flowers, such as Aconitum spp., present in the walk area. The minimum distance to nectar of Lathyrus pratensis is abnormally short, the flowers dissected were full of nectar, but few were foraged (FIGURES 3 and 5). In the corolla of Centaurea nigra small beads of nectar were visible with a x10 hand lens 2-4 mm down the corolla tube, although the nectary is about 10 mm from the corolla opening (Knuth, 1906). The nectar status of pollen flowers was not examined. Centaurea hypoleuca has very long, showy outer florets which were occasionally probed by the larger queens, on examination it was found that these florets contained no nectar and were sterile, these visits were excluded from the data. The central florets provided copious quantities of pollen which was collected by the workers. During June and August there were many other visitors besides bumblebees foraging on the flowers, but the bumblebees outnumbered all other insects, except on Cotoneaster simonsii in June, where the wasps were more numerous than the bumblebees, and in August on Hypericum perforatum, where honeybees by far outnumbered bumblebees; however at no time were the numbers high enough to be considered as competitively excluding bumblebees, as the number of honeybees never exceeded three on the whole plant at any one time. The species of flowers foraged by bumblebees during the bee walk were open before 6 a.m. until after 8 p.m., therefore were available for all eight bee walks in a day. FIGURES 4, 5 and 6 show the flower preferences produced by the PREFER program for the bee walk in June, July, and August respectively. The program is such that if no preference was being shown then each species of flower would have an equal proportion of the pie chart. If the proportions are unequal, or if a flower species is not allocated a portion of the chart, this indicates that a preference for one or more species is being shown. It is not possible, using this program, to allocate statistical significance to these preferences. Consequently, in the preferences reported below, only strong deviations have been included. FIGURE 4. Flower preferences of bumblebees foraging in the bee walk in June 1995. FIGURE 5. Flower preferences of bumblebees foraging in the bee walk in July 1995. FIGURE 6. Flower prefernces of bumblebees foraging in the bee walk in August 1995. In June (FIGURE 4) each species of bee showed a clear preference of one species of flower; Bombus lucorum and B. lapidarius preferred Allium schoenoprasum; B. pratorum preferred Cotoneaster simonsii; and B. hortorum and B. pascuorum preferred Vicia sepium. Only five species of flower were visited, and no species of bee visited all five species of flower. It was noticed that some Bombus lucorum robbed Vicia sepium by biting through the calyx to get at the nectar, no other species of Bombus was observed to use these holes. In July (FIGURE 5) there were very few bees foraging in the bee walk area, only one B. lucorum was seen foraging just once during the whole five days. Preferences are shown, and those of Bombus pratorum and B pascuorum for Centaurea hypoleuca are quite strong, but the number of observations for all species is quite small. In August (FIGURE 6) bees returned to forage in the bee walk area, and the number of observations for all species increased. Eleven species of flower were foraged; Bombus pascuorum visited eight species and showed a preference for Stachys lanata then Digitalis purpurea; B. pratorum also preferred S. lanata. B. hortorum strongly preferred Digitalis purpurea, and B. lapidarius strongly preferred Centaurea nigra. B. lucorum showed almost equal preference for three species, Cirsium arvense, Stachys lanata and Cirsium vulgare. Throughout June, July and August the most preferred flowers of B. pratorum were all situated within a 3-4 m area of the bee walk. In all three months the preferred flowers of B. hortorum and B. pascuorum belonged to the two groups with the greatest handling difficulty, and have longer distances from corolla opening to nectar.